Our homes take quite a beating from the elements, and the garage floor is especially susceptible. Because of the nature of garage space and the items stored in it, the floor is usually dingy and there is always a need to repair it. Quikrete epoxy garage floor coating, however, can be pretty useful in garage repairs. Not only is it cheaper than other solutions; it is also pretty easy to use, which is why it is the go-to coating for most DIY-ers. WHAT IS QUIKRETE EPOXY GARAGE FLOOR COATING? It is an epoxy coating product for garage floors that is created by Quikrete. Quikrete Co. is the leading manufacturer of cement mixes and packaged concrete in the USA and Canada. Quikrete products are created and sold in numerous branches not only in America, but also in Canada, South America, and Puerto Rico. Aside from the epoxy garage floor coating, the company also makes floor underlayment, concrete mixes, concrete repair products, mortar mixes, cements, stuccos, tile setting systems, waterproofing products, blacktop products, sand and aggregates, and related items. 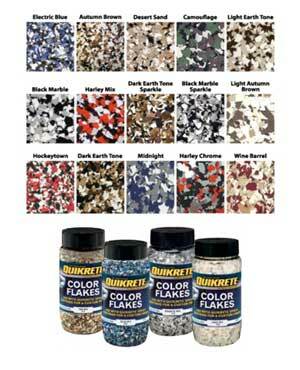 Quikrete epoxy garage floor coating comes in a kit. The package typically includes the epoxy, cleaner, etcher and degreaser, stir stick, color flakes, and a manual for application. 1 Car kit contains 3.55 liter pails that can cover up to 250 square feet of floor. Epoxy is a liquid substance that hardens after processing. It is useful for coatings because it is easy to apply yet strong and durable. It is composed of epoxide resin and polyamine hardener – when these two parts are combined, a chemical reaction results and causes the resin molecules to bind to a surface. WHAT ARE THE ADVANTAGES OF USING EPOXY COATING? WHAT ARE THE DISADVANTAGES OF EPOXY COATINGS AND HOW DO YOU WORK AROUND THEM? Epoxy coating tends to become yellowish when exposed to direct sunlight regularly. If your garage does not receive ample light, you need not worry about this happening. Otherwise, you may add an anti-UV coating or a polyurethane coating on top of it. 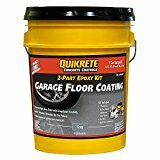 WHAT ARE THE ADVANTAGES OF USING QUIKRETE EPOXY GARAGE FLOOR COATING? WHAT CAN BE DONE TO PREVENT THE QUIKRETE EPOXY COATING FROM PEELING? Follow the instructions printed on the manual that comes with the product. An instructional DVD is also available. If you have lost these, contact a Quikrete representative and ask for guidance. Remove oil and grease before you begin the application. If you have used a degreaser, get rid of that as well. These substances will prevent the coating from bonding to the concrete. Check whether the surface is oily by pouring water on it. If it does not become absorbed in the concrete, it may be layered with a film of grease. Make sure that the surface is free from cleaning residue. The chemicals used for preparing and cleaning the floor must be totally removed before applying the coating. Do not allow chemicals and liquids to remain there for prolonged periods of time even if they dry up eventually. Quikrete has cleaning and degreasing products. Eliminate all old floor coatings and sealants. These need to be ground off with a diamond grinder. You can tell whether there are sealants on the garage floor if poured water turns to beads upon meeting the surface. WHAT IS THE IDEAL GARAGE FLOOR FOR THIS COATING? WHAT ARE THE IDEAL CONDITIONS FOR COATING A GARAGE FLOOR? It is recommended to coat a floor in well-lit conditions with environmental temperatures between 60 to 90 degrees Fahrenheit. Warm, breezy weather will help in drying the coating quickly. 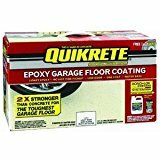 WHAT IS A QUIKRETE EPOXY GARAGE FLOOR COATING USED FOR? Your floor must not be damp – check for moisture by taping a plastic bag to the floor and letting it sit there for a whole day. Afterward, lift the bag and check if it has accumulated dewdrops under it. If it did, the floor is moist and you can’t start coating. Water breaks the chemical bonds between the epoxy and the floor surface. It’s best to wait until weather improves before going on with your coating project. If you have no choice but to begin in bad weather, make sure that you have a breathing mask, an electric fan, and absorbent materials to facilitate floor drying. The garage floor surface must be prepared before applying the coating to ensure that the coat will adhere to the material. 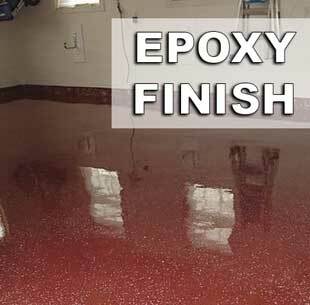 The epoxy is specifically designed to stick to the floor and not to other objects. You must eliminate foreign objects from the surface or these will prevent the coating from adhering properly. First, remove everything that is on the garage floor – your cars, furniture, equipment, storage boxes, litter, etc. It’s impractical to have these around when you’re coating the floor. Sweep or vacuum the floor. Epoxy application requires a well-cleaned floor. The coating is supposed to bond with the surface so there shouldn’t be anything in between them. If your floor was previously coated, you need to scrape this off. Old coats may prevent the new epoxy from sticking. You need a diamond grinder for this. Otherwise, you can use a garden edger or a tool that can scrape them off well. This goes the same with drywall and other material that got stuck to the floor. When the large objects and the coatings are taken care of, it’s time to deal with small dirt particles and oil. This is where chemicals come in. The Quikrete garage floor epoxy kit contains a solution that is a cleaner, etcher and degreaser rolled into one. The cleaner and degreaser removes oil, residue, and dirt. The etcher creates grooves in the concrete so that it will accept the coating and bond to it securely. Apply this to the entire area that you intend to coat and leave it on for about a minute. Use a bristle brush to completely scrub off residue that came loose after applying the cleansing product. When the surface is thoroughly scrubbed, rinse off the floor. You need to remove both the dirt and the cleanser before using the epoxy. Remember: wash the floor off and do not allow the cleaning material to become dried on the floor. Use a hose or a bucket to move away the dirt into an area that will not require coating. Wipe off the water with a clean and absorbent material such as a towel, mop, or sponge. An electric fan will help dry off the water. The epoxy may be capable of hiding small cracks and grooves on the floor, but larger cracks may still reveal themselves. Aside from that, these cracks will collect moisture that get trap under the coating – this will eventually cause the epoxy to peel. You need to patch these up before you can safely add epoxy to your floor. For this, you will need an epoxy crack filler. The Quikrete epoxy kit has 2 parts to allow the user to mix them thoroughly. Combining these starts the thermosetting reaction. Wait for 30 minutes then start putting the epoxy on the floor. You must be prepared to use the mixture immediately, so do not mix them unless you’re ready. If in case you were not able to apply it within two hours, stir the epoxy to prevent it from hardening within the container. The application begins immediately after mixing the epoxy parts. Use a small brush to put the coating along the trim of the room. Afterwards, use a roller or a brush to coat the entire floor. Make sure that you coat the epoxy evenly to prevent repeating the process. Be warned that the coating is thick so it will take some effort to spread it on the floor. Use a roller to make the job easier. Roll it on in a single direction to prevent the epoxy from building up. If you intend to change directions, do it at a 90 degree angle to keep the coating flat. Color flakes add decoration to the floor. You may choose to use these or not; these flakes are not needed to make the epoxy stick and they are merely for artistry. The epoxy kit contains these color flakes. These color flakes are spread while the epoxy is still setting, so it’s best to stop coating the epoxy when you’re done with a small section of the floor. Take note that flakes have varying sizes, and bigger ones tend to rise to the top of the container. To avoid spreading large flakes in one area of the garage and small flakes in another, shake the container first. This will ensure that you will get randomly sized flakes when you pour them out. Like color flakes, a clear epoxy coat is also optional but quite useful. If you have applied flakes previously, you need to seal them with an additional coating because they are sitting on the epoxy layer instead of sinking in it. If uncovered, the flakes will create a jagged surface. Being exposed also increases the chance that they might come off. Aside from protecting color flakes, a clear coat will also provide extra shine to the epoxy coating. If you want an intensely glossy floor, add a layer of transparent epoxy to your main coating. Caution: Although clear coats are attractive, they can become slippery. If you want a non-skid floor, do not apply a clear topcoat. You can increase traction in your epoxy floor by pouring a non-skid additive over the surface of the coating. Again, since color flakes require a clear coat, do not use color flakes if you don’t want your floor to become slippery.